She gazes into unfathomable space, and her body itself is luminous, empty of solidity…she is the manifestation of coemergent wisdom, the all-inclusive wisdom generated in meditation. She captures the totality of the minds of the yogis and yogis, bringing both poles of attraction of revulsion directly to the path of realization. She cannot be conceptualized or categorized. She stops the mind. 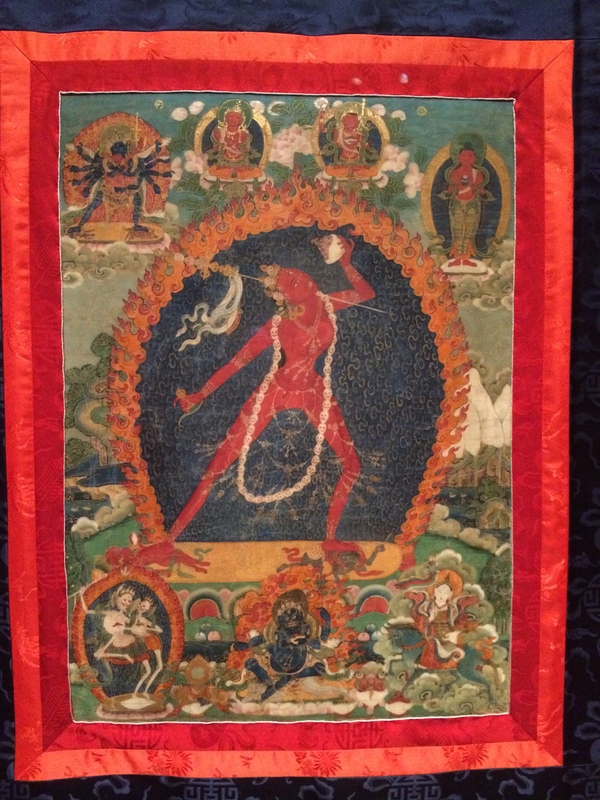 The dakini refuses to accept the logic of life versus death, gain versus loss, and pain versus pleasure. This logic is the reasoning of the endless suffering in which we are trapped, and when we perpetuate this approach we are trapped in a samsaric prison. The dakini shows that landscape in which this hopeless logic disintegrates and we directly experience the world as it is, infused with intensity and natural power. In this charnel ground, beauty has no rival in ugliness. The polarities have collapesed, and great joy is found in the greatest devastation. This is the power of the dancing dakini.